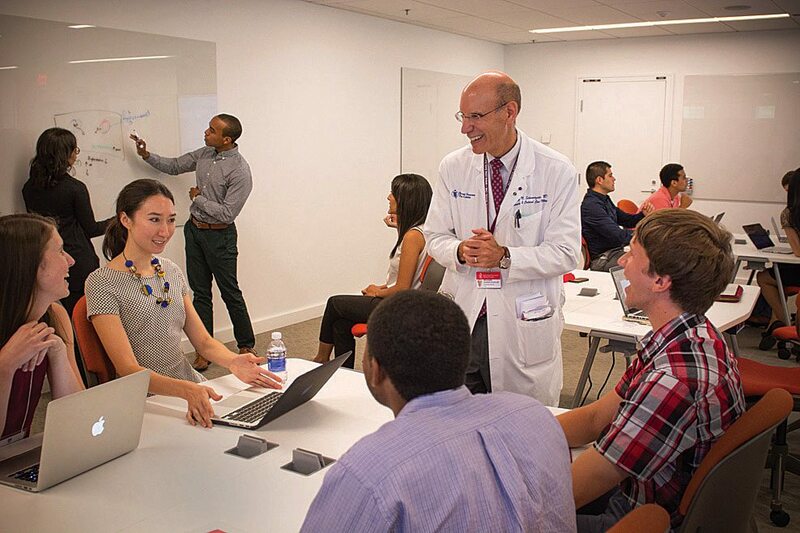 On the first day of the new curriculum’s launch, Gordon professor of medical education Richard Schwartzstein (at far right, and in subsequent photographs) leads an orientation in a large group classroom equipped with interactive technologies that facilitate case-based collaborative learning. 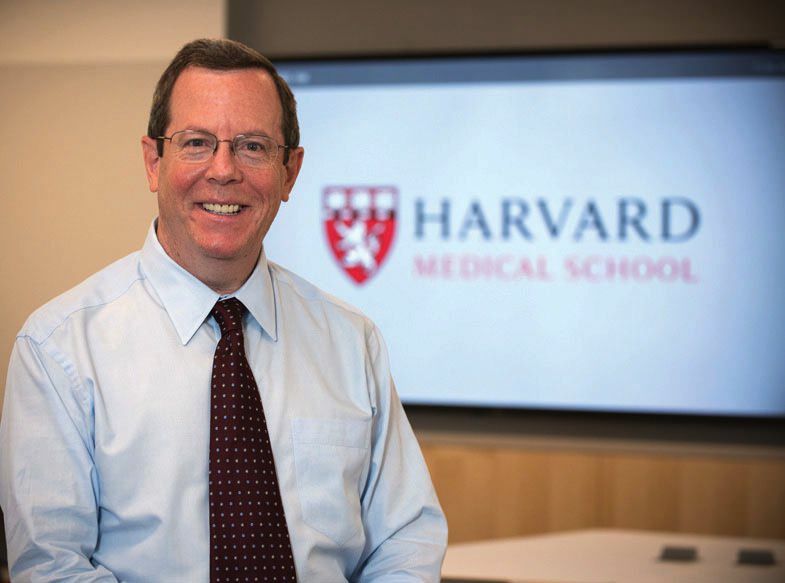 Harvard Medical School (HMS) is reforming its four-year curriculum structurally, pedagogically, and philosophically. 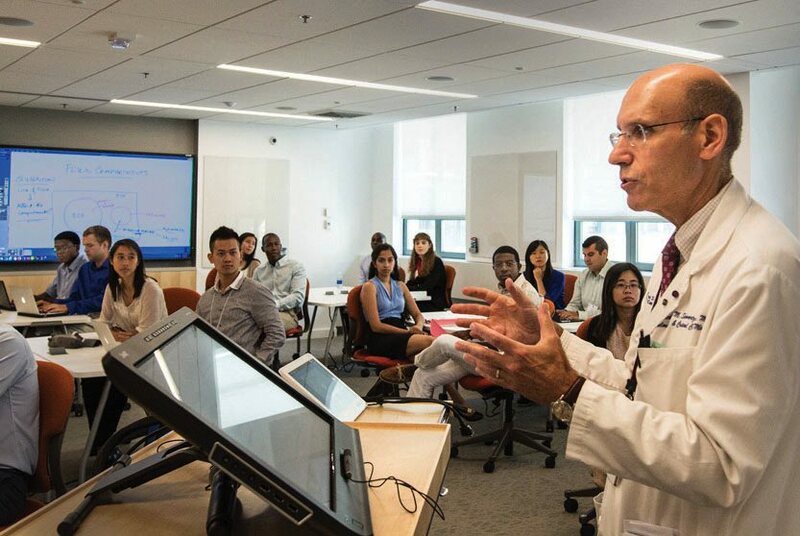 The new curriculum, which builds on the New Pathway curricular reform of 1987 and an iterative update in 2006 called the New Integrated Curriculum, further emphasizes the process of learning to learn, rather than rote memorization, and represents one of the most complete curricular reforms at a U.S. medical school since the scathing Flexner Report of 1910 led to the closure of many medical schools in the country. The new curriculum therefore gets away from lectures. Called “Pathways” (not to be confused with the “New Pathway” curricular reform of 1987 that introduced problem-based learning in the first two years), it begins with an intensive, 14-month pre-clerkship program, designed to give students the core medical knowledge they will need to work in hospitals. Students acquire critical knowledge before class through modular faculty-developed “concept videos,” each roughly five to eight minutes in length, in addition to assigned readings and questions to investigate. Class time is used to develop the thinking and reasoning skills needed to solve difficult problems; teams of four or six students are assigned to share their findings with the rest of their 40-plus-person class in a discussion that generates a consensus answer. Four mornings a week, students grapple with a variety of biomedical subjects, such as genetics, anatomy, pharmacology, pathology, and immunology. All day Wednesday, they take “Practice of Medicine,” co-led by assistant professor of medicine Fidencio Saldana, which is designed to give them hands-on skills for working with patients, such as conducting an oral interview and performing a physical exam. As part of this pre-clinical preparation, students will spend every other Wednesday morning working in a primary-care office. One advantage of introducing students to work in medical settings right away, says Saldana, is that it leads to “better integration of the basic, social, and clinical sciences.” That way, students will “have context for everything they are learning in class,” and be well-prepared for their clerkships. That “principal clerkship experience,” in which students enter hospitals to begin working with patients on the wards, will now begin in October of their second HMS year. Planners reasoned that they should put students in contact with what they love—working with patients—as soon as possible. And to maintain continuity with patients and doctors they have come to know, students will continue to spend a half-day every other week in the same primary-care office where they worked the year before. By the time students return to the classroom for their third and fourth years, they will have a better idea of what they want to do next, says McKenzie professor of cell biology Randall King, an active researcher who serves on the academic planning committee. The curricular change “will allow students to develop their clinical interests earlier, which will help them in thinking about residencies. Pedagogically, they will be in a position now to really take advantage of the richness and the depth that the medical school has to offer”—basic scientists and clinicians working in many different fields. “By allowing students to tailor their post-clerkship curriculum a bit more,” he adds, “we think these advanced courses will become a place where students can meet with faculty in more of a seminar-type format and really pursue” cutting-edge questions. Longer-term, Schwartzstein hopes the curriculum will be organized to address questions that need to be answered, rather than merely to present a body of knowledge. And he hopes to teach students to think about how they are thinking. “We have to help teach our students not only how to reason, but how to avoid the pitfalls associated with cognitive biases,” he emphasizes—because relying on intuition or pattern recognition may cause errors in clinical practice (see “Toward Precision Medicine,” May-June, page 17). 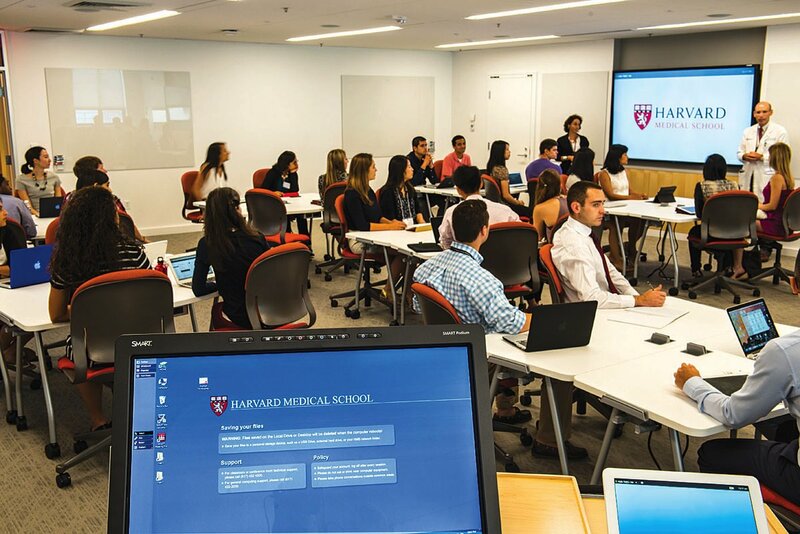 On August 3, the first day of orientation for the HMS class of 2019, students immediately got a taste of case-based collaborative learning, working in teams of four to reason their way to explanations for a difficult clinical situation—all in brand-new classrooms equipped to facilitate learning under the new curriculum. In the Tosteson Medical Education Center, 10,800 square feet of space has been renovated this summer at a cost of $5 million to create four new “learning suites,” each equipped with three different types of rooms. The largest room is designed to support interactive group learning. An adjacent “damp lab” features multi-user microscopes where students can work with human tissue or anatomical specimens. The third connected room in each suite supports the use of patient simulators that allow students to see what happens to blood pressure, for example, when they administer a particular drug.